Blighty's Tuck Store just started bringing in really top class pies from a new baker. One of the new flavours is the popular Steak and Stilton pie. Stilton is one those quintessentially British cheeses that has a strong flavour that adds a superb richness to a well-made succulent steak pie. Dice the steak into small chunks and quickly brown in a little hot oil. Sample the gravy - it is rich and superb! The Stilton melts and blends into the gravy to lend its unique richness to the flavour of the meat. So you think you don't like Stilton because of those blue veins in the cheese? Don't worry, when Blue Stilton is cooked in a pie it no longer has the bitterness of the uncooked cheese. 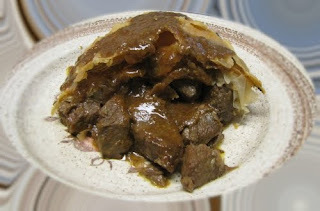 I thoroughly enjoyed my Steak and Stilton Pie as I hope you will enjoy yours. But wait, there was enough Stilton and flaky pastry left over after preparing the pie for a couple of bonus recipes. 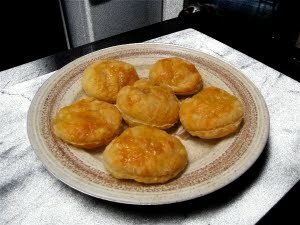 I cut the spare pastry into round pieces about three inches in diameter and made an hors d'oeuvres and a dessert. To make the hors d'oeuvres, lay slices of plum on a piece of pastry and bake until the pastry has risen and golden. 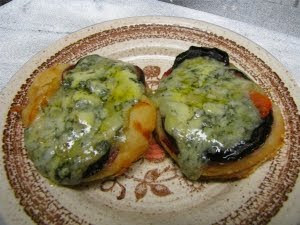 Remove from the oven, put a tablespoon of grated Stilton on top and return to the oven until the cheese begins to melt. Serve immediately. To make the dessert simply spoon a little Lyle's Golden syrup over the pastry before baking. Serve with custard or whipped cream.